The time to start living for the planet is now! If you’re looking for simple tips on how to become more eco-friendly – tips that you can implement right at this moment, read on! Living a green lifestyle does not mean you have to immediately buy new things in order to make a difference. It’s true that there are some key items that will be useful to eventually purchase to further your eco-friendly efforts and impact. However, they aren’t needed TODAY. Today, we are going to learn to live greener by making simple changes and smart choices. The more we know, the more we can do. So, here is a list of simple ways to help the environment without spending money. Ask your dentist if you don’t believe me, but a pea-size amount is all you need for your dental health. You only need an entire strip to cover the whole toothbrush if you’re in a toothpaste commercial. There is no need to keep the water flowing while you’re brushing for 2 minutes. Even better, you can use a cup to rinse your mouth instead of cupping water into your hands. The average person showers for 5-10 minutes. Cut it down to under 5 minutes – be above-average! Hot water dries out your skin and hair. Any decrease in water temperature and your body will thank you. You’ll also save in energy costs, yay! It takes some getting use to, but you can even consider cold showers. Cold showers will make you stronger – mentally and physically. That list is long enough to scare anyone – even without the word ‘cancer’ behind every single one of them! Interestingly, even with all these contaminants, the conclusion is that the “tap water provided by this water utility was in compliance with federal health-based drinking water standards”. So crazy! Despite the contaminants present in the water, it’s still safe to drink. The solution to remove these contaminants is to eventually invest in a water filter. Shifting to bottled water is NOT the solution. Laboratory testing by the same group (EWG) on popular brands of bottled water found contaminants like disinfection byproducts, industrial chemicals, prescription drugs, and bacteria. The kicker is that the bottled water industry does not need to disclose this information whereas your public water utility company does. In that regard, my guess is that tap water is still safer and cleaner than bottled water. I’ll continue to drink from the tap at my parent’s house, but I’ll be recommending a good filter for them! I used to work from 9am to 9pm. Since the sun would often set before I came home, I would leave the lights on when I left in the morning so my cats wouldn’t be sitting in the dark in the evenings. Since participating in a few Earth Hours, I’ve finally realized sitting in the dark is completely fine and normal. I no longer keep my lights on an extra 12 hours to avoid the 2 hours that my cats would be sitting in the dark. Don’t crank up the heat in the winter, just turn it up a little bit and wear an extra sweater or scarf. Also, wear some thick socks. Warm feet feel nice and thick socks are cozy. Go thru your home every so often and donate any items that you haven’t used in the last 2 years. What is simply taking up space in your home could be very valuable to another person. Remember, second hand is the new first choice. You can save the hot water for when something needs a deep clean or disinfecting (i.e. towels / bath mat, a soiled bedsheet, or cleaning rags). Otherwise, cold water will be sufficient to clean your clothes and will extend the life of your items. You don’t need water running the entire time, especially when soaping. You might have to get your tap knobs soapy once when you transition from soaping to rinsing, but consider that the daily cleaning for your knobs. Simply rinse the soap away and wipe dry with a dish towel. I always grew up with a dryer, but when I moved into my Amsterdam apartment, it did not come with a washer / dryer. My apartment is relatively small so all I could fit was a washer. For drying clothes, I started using a drying rack. I thought I would hate it, but I’ve grown to really like it! Even when I move back to the States and have a dryer, I’ll be using a drying rack to air-dry my clothes. I generally start a load of laundry after coming home for work. After a 3-hour wash cycle, I set up my indoor drying rack and air dry my clothes right before bed. It takes 5 minutes to set up. When I wake up, I can fold and put away most of the clothes. Jeans and other thicker items need to be dried for a bit longer and so I will put them away after I come home from work. If I simply wipe down my toaster oven after each use, or even once a week, I could use a wet towel and a simple homemade cleaner with essential oils to clean it perfectly (those with pets, here are a list of essential oils not toxic to pets). But because I don’t do this simply task regularly, I now have long-term build-up of burnt sauce and crumbs plastered to the bottom of my toaster oven. I’m tempted to get a powerful, not eco-friendly cleaning spray to get rid of it easily, but I don’t want to. So I’ve been putting it off for the last 3 months… which, honestly, looks pretty gross. Don’t be like me – be a clean person! We all crave snacks sometimes. If you’re buying packaged products, skip those ‘snack-size’ bags. Just purchase the largest size available and divvy it up at home in reusable containers. You’ll prevent a lot of packaging from entering the trash stream. This is the same with bottled water, soaps, and many personal care products. Just like a large purse tends to collect the most random items over time, so too does your car backseat or trunk. Don’t make it a habit to toss things in the back of your car and forget about them. The heavier your car is, the more fuel it will use. Both plastic and paper grocery bags don’t have to be one-use bags! Bring them back to the store and keep using them until they rip. Even if you’re against plastic. If you have them already, use them as much as you can. We all run a number of errands each week, but sometimes the errands pop into our heads over the course of the week. Instead of getting them done as you think of them, consider dedicating a few hours one day to do them all at once. You’ll save time and fuel. Most companies have the option for paperless communications now. Take 2 minutes to set this up and you can avoid all the paper mail. The second benefit of this is that you have a decreased chance of identify / account theft. Not everyone always remembers to shred documents that contain sensitive information. Take 15 minutes to learn about how recycling works in your city once and for all! Simply search ‘recycling in <<enter your city>>’ and you’ll find the information you need. Ecosia is a search engine that uses 80% of its profits to plant trees. This is at no additional cost to you. If you don’t need a straw, simply state so at the end of your order. I generally will say something like ‘ginger beer, no straw, please’. Two extra words – I think we can all manage that! I know so many things on the menu sound delicious, but don’t be greedy! Only order what you know you’ll finish so you can avoid food waste and take-out containers. Animal agriculture is one of the biggest contributors to global warming. In addition, our love of seafood is contributing to the destruction of healthy ocean life. If you’re in the habit of eating meat every meal, perhaps try cutting it out of breakfast and lunch. Or perhaps consider cutting your portion size. If you need some general guidance, I wouldn’t recommend eating more than 125 grams of 0.25 pounds in one sitting. Substitute the deceased meat on your plate for some extra veggies and you’ll be happier and healthier for it. It’s important to stay hydrated, but you don’t want to be purchasing bottles of water or cans of sugary juices all the time. Carry around a water bottle and always have water on the go. As a general guideline, you don’t NEED anything that’s offered to you for free. You might want it. But it’ll probably be of low-quality (like a company-branded pen or lanyard). Or it’ll be a tiny bit of food that won’t be enough to satisfy you anyway. When I was a kid, I would walk thru Costco with my mom and try all the samples. I thought nothing of using the plastic fork and the tiny plastic container to eat my tiny morsel of food. I now realize how incredibly distressing this should be. Costco always has at least 5 food samples happening whenever I visit. They probably serve thousands of samples daily in each store. With more than 700 stores around the world, that is A LOT of plastic waste simply because we love free stuff. And this is just one company. Try to avoid free sample – they aren’t worth it to the environment. Research the products that you buy so thoroughly before you buy to decrease the likelihood that you’ll have to return an item. Returning an item results in additional transportation of the item back from where it came – doubling the emissions of the shipping process. When shopping, if you have a choice between similar products, choose the product with less packaging. If they are both in packaging, choose glass over tin over paper over plastic. If they’re both made of plastic, choose the one that is recyclable. If it’s not recyclable, buy something else. Multiply the impact of your knowledge by sharing this list with others. 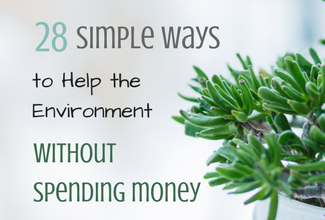 There are so many simple ways to help the environment without spending money just by making easy changes and smart choices. We should all strive to learn to live greener. By following the easy suggestions in this list, you’ll be well on your way to living a green lifestyle. You’ll also end up saving money, which is a happy side effect of using fewer resources and having less of a toll on the planet. all good tips, and I’m glad to say I do almost all of them already! I try to minimize my carbon footprint as best I can because our 6 year old definitely is a more is more kind of kid. Wow so many ideas ! I will definitely be adding some of these ideas to my to do list. Thanks for the tips ! A lot of very good ideas. My local water report scared me too and we saved up for a filter that goes onto the faucet. It was around 50 dollars not bad. For those on a strict budget, a brita pitcher with a filter is around $10 and it really does make tap water taste much better :). Plastic water bottles are probably the worst unnecessary contaminant on the planet. These are good ideas. I always sign up for paperless everything.